Written by: KristaG on March 7, 2016. With Sentinels of the Multiverse: OblivAeon about to complete its Kickstarter campaign in the next few days, it is a very bittersweet time in my house. After five years of epic clashes between various comic book-style heroes and villains, the fight for the Multiverse is approaching its greatest and final battle. Part of me can hardly wait until next year when the expansion is officially shipped so I can rip open the packaging and rifle through all of the new editions to the environments, heroes, and villains. I also am extremely excited to see the alternate versions and new artwork for some of my favorites – including the special anniversary edition foils! Another part of me, however, is deeply saddened to see this part of the Sentinels Comics franchise come to an end. Though he may look, act, and somewhat consistently break the 4th wall like Deadpool, this is definitely “not” Deadpool. His name is Guise and he’s one of my favorite mini expansions! The co-op card game was unveiled by Greater than Games at Gen Con in 2011 with the release of multiple full and mini expansions over the years. While I was not present for the initial release, nor did I even get to try out the game until nearly 2 years afterwards, I do remember when my then best friend excitedly dragged me over to the table at our preferred local game store to introduce me to his new favorite game. Even at first glance, I was drawn immediately to the game by the artwork covering the colorful box. The heavily stylized box contains 578 cards, 162 tokens, some really cool dividers for sorting each individual deck, and a rulebook – with plenty of room in the box to contain expansions! Those 578 cards are then further broken down into 10 40-card Hero decks, 4 25-card Villain decks, and 4 15-card Environment decks. 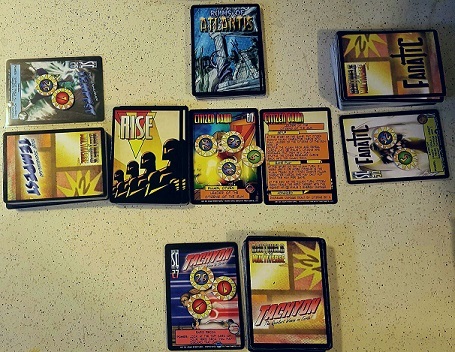 Sentinels of the Multiverse is ultimately designed for 3-5 players, though it is marketed for 2 or more as long as at least 3 Heroes join the fight. I, however, have also enjoyed many a solo game where I play all of the Heroes in a fight against one of the various Villains. There are multiple ways to enlist Heroes for an encounter: dispensing them at random, allowing players to choose their favorite, or by playing as a character inspired by a favored comic book character. The Heroes included in the box set are Absolute Zero, Haka, Legacy, Fanatic, Bunker, Ra, The Wraith, Tempest, The Visionary, and Tachyon – my personal favorite of the original ten. 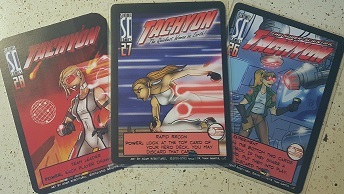 Once the Heroes and their respective decks have been distributed, each deck is shuffled and placed next to the Hero character card in each player’s personal play area. To create the opening hand, each player will draw the top four cards from their shuffled Hero deck. Tachyon and all of her current Variant forms. Once this is done, a Villain to oppose and an Environment for the setting of the battle are chosen. These may also be chosen at random if no one has a preference. Each villain has a different rating of toughness – ranging from 1-4. The toughest villain in the original box set is tied between Grand Warlord Voss (an alien warlord leading an entire fleet!) and Citizen Dawn (leader of the Mutant Supremacist faction). Both of them have a ranking of difficulty 3. The other two villains, Baron Blade and Omnitron, are tied with a difficulty ranking of 1. Though Omnitron has a toughness of 1, I still feel he is one of the toughest Villains for us to beat with all of the bots he is able to generate. In addition to toughness ratings, Villains and Heroes can be paired up as arch-nemeses as indicated by specialized symbols on either the Villain or Hero character cards. I feel that having arch-nemesis to fight against adds an extra bit of flavor to the game and helps tie in with the comic book theme. Every Villain will also have a setup specific to that character and the set up will always be explained on that particular Villain’s character card. The Environments are one of my favorite features of the entire game. Not only does it add a physical setting to the stories being told, but also new characters and events as well. Many of the Environments are completely nonbiased and can either help or hinder the Heroes – sometimes even both! Environments can and will target almost anything in play on the board including Villain, Hero, and even other Environment cards. I have actually played games where we had almost defeated the Villain and all of their minions, which would have won us the game, but the Environment managed to wipe us all out before we got a chance to finish them off! These types of twists can cause certain Villains to be more or less difficult depending on the setting for the fight, but also can add to the excitement and enjoyment of the aesthetic of the game itself. The box includes the following 4 Environments: Insula Primalus, Megalopolis, Wagner Mars Base, and the Ruins of Atlantis. These Environment cards are one of my favorite features of the entire game!! The game consists of 3 turns, beginning with the Villain turn. 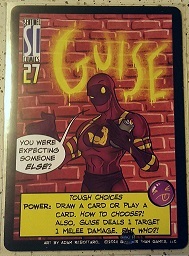 Players follow all of the “start of turn” instructions on the Villain character cards as well as on any of the other Villain cards currently in play. This is then followed by drawing and playing a card from the top of the Villain deck and then resolving any “end of turn” instructions listed. Turn 2 consists of the Hero turns. Every Hero, starting clockwise from the Villain, gets to play through 3 phases per turn: play a card, use a power, and draw a card. These phases, however, are optional and you can choose to skip both playing a card and using a power in order to draw 2 cards instead of 1. Lastly, even the Environment gets a turn! As with the Villain cards, start every Environment turn with any and all “start of turn” instructions, draw and play a card from the deck, and end the turn with the “end of turn” instructions. This pattern will continue until either all of the Heroes have been defeated or the Villain has been vanquished. See what I’m talking about? So many, many tokens and this isn’t even the beginning of the game yet! This is just set up! As stated above, there are a bunch of tokens included to keep track of HP and various status effects. However, we tend to either use pen and paper or Sentinels Sidekick to keep track of everything. Sentinels Sidekick is a companion app put out by Handelabra Games and is, in my opinion, one of the best companion apps for a game that I have ever come across. Not only does it keep track of every hero’s hit points, but also those of the villain, their minions, other hero targets and the environment cards. Status effects, buffs, debuffs, boosts, and other ongoing effects are also all kept track of easily using the app, which is now available for both iOS and Android for $3.99. If you’re like me, tons of tokens can be hard to keep track of and kind of a pain, making this app the perfect solution! Over the years, Sentinels of the Multiverse has been consistently played by our various play groups, enjoyed at family game night (even by those that aren’t into comic books), and demoed for anyone interested in trying out the game or for official game store events. With each expansion, promo card, and variant card added to the game since entering our home, Sentinels has become a beloved investment with so much re-playability and variation that it is one of my personal all time favorite card games to play. I love the visual aesthetic of the game – from the cover art that looks like a comic book cover to the chosen font for the rulebook and cards! It all ties together beautifully and leaves me aching for physical comic books to go with the fluff centered around the Sentinels universe (or Multiverse as the case may be)! I would and do highly endorse this game for all ages. The base set has been gifted by me to several of my friends and family along with the hopes that they will add to their sets as we have to ours and I hope that spreading word through this review will encourage you to pick up a copy of your own.